DODGE CITY, Kan. (May 5) – Kevin Gray battled into the lead on the fifth circuit then held off Arizona’s R.C. Whitwell over the closing rounds to post his first local IMCA Modified win since August of 2015 on opening night Saturday at Dodge City Raceway Park. Gray gridded the feature outside the front row, but it was pole starter Ryan Heger gunning into the lead at the drop of the green flag. Gray kept the heat on and raced back into the lead on the fifth lap. While Gray slipped away, Whitwell worked his way into second just past the mid­way point and closed in to challenge over the final circuits. 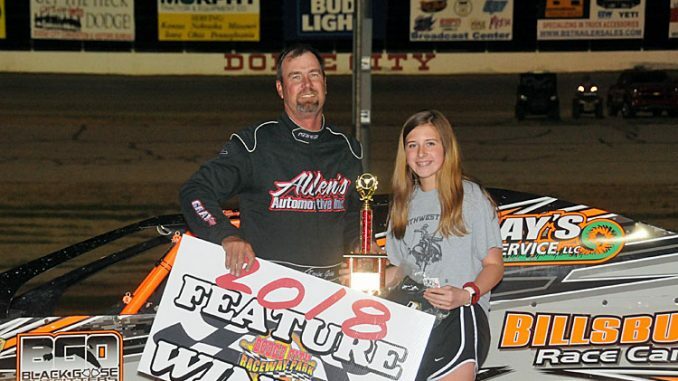 Whitwell poked his nose under Gray in turns three and four on the white flag lap and then took a shot on the high side on the final round, but Gray held steady to post the win. 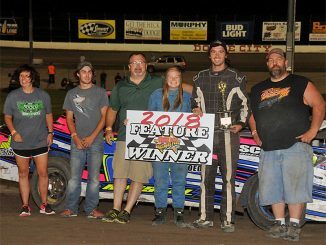 Recently back in the seat after a layoff of more than 15 years, Troy Burkhart wired the field to take the win in the 20-lap IMCA Stock Car feature. Burkhart raced into the lead at the outset from the pole position but had his hands full much of the way fending off Ron Hartman for the lead. Burkhart sur­vived a final caution with just two laps to go to preserve the win. 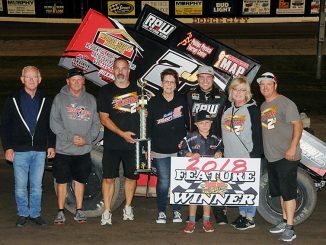 Four-time and defending IMCA SportMod champion Jeff Kaup opened things up in a familiar way by racing to victory lane in the 20-lap feature for his 17th Dodge City score since the 2012 season. 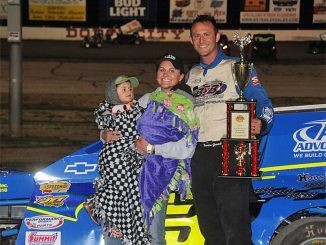 Duane Wahrman picked up where he left off last season by winning the 20-lap IMCA Sunoco Hobby Stock feature.